my first $10 have disappeared into the gambling rabbit hole. actually, make it $8. 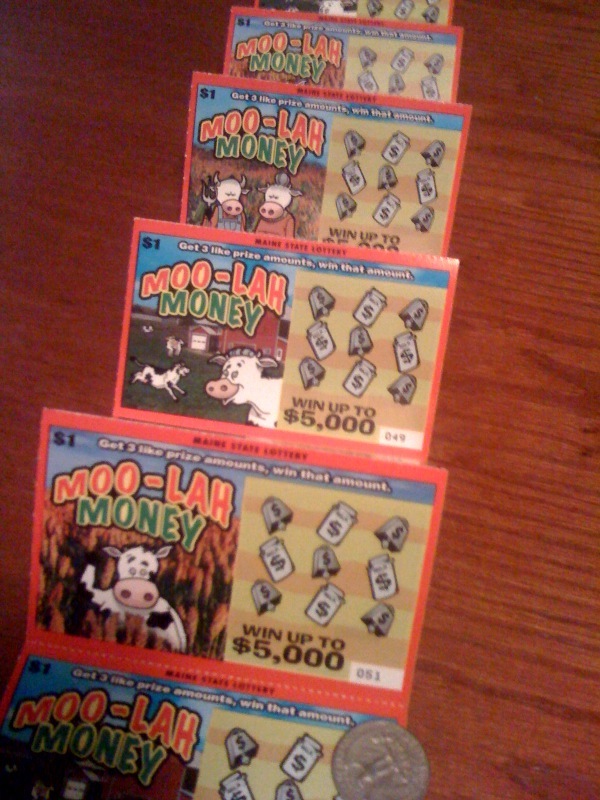 i let the clerk at the big apple on washington ave (you know, the one that keeps getting robbed) choose the ticket, and he decided to go for moo-lah money. good choice. 10 tickets in a row, and only the first 2 were winners. $1 winners. next time, i’m getting assorted tickets. although i do have to say that these cows are hilarious. on a random related note, looks like channel 13 is airing a story tomorrow about chasing the “lottery loot”. i think maybe it’s about figuring out where the money that the state keeps from the lottery goes… but i’ve had a couple glasses of wine and it was a short commercial. live at 5. check it out. I’ve heard that the beginning and the end of the scratch ticket rolls have a higher percentage of winners. interesting! i have so much to learn! i wonder if the check out clerks will tell you if they just put out a new roll, or if that’s a closely guarded secret?